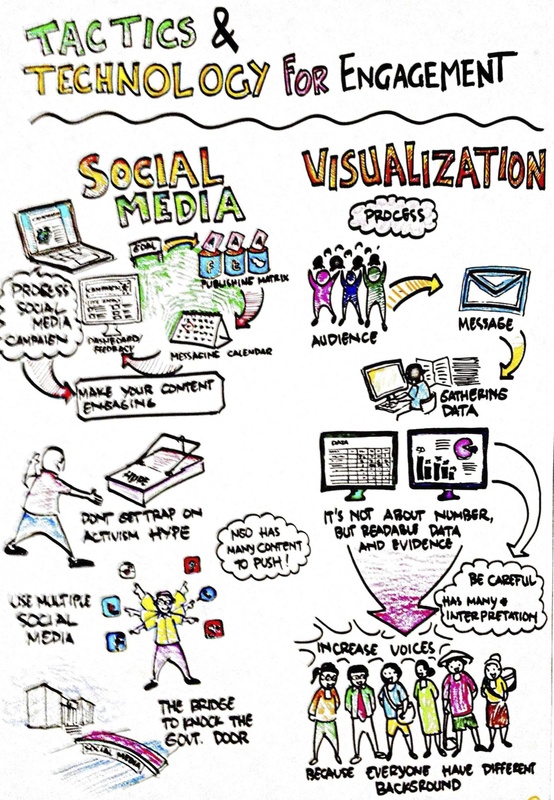 Home » The FabBlog » Forget written notes, try graphic recording! Forget written notes, try graphic recording! This blog post initially appeared on the TABridge Blog at: http://tech.transparency-initiative.org/notes-by-graphic-recorders-capture-the-moment/. Special thanks to Jed Miller for editing. I recently traveled to Jakarta for “Matchmaking Budget Transparency & Technology,” a three-day event convened by The Southeast Asia Technology and Transparency Initiative (SEATTI). The meeting was facilitated by Aspiration’s Allen “Gunner” Gunn, so the free-flowing format closely resembled our own. But one major difference was the real-time documentation created in drawings by professional illustrators Graphic Recorder Indonesia. Organizers chose this technique over traditional note-taking and the results were remarkable. Because the illustrators posted their drawings on the walls after each session, the brightly-colored pictures served as reminders not only of key points but of the group’s progress and momentum. I was especially struck by the power of documentation that is available to the group almost immediately. And these drawings are far more informative than photographs, because they illustrate the ideas behind key moments, not just isolated instants. As you can hopefully see in the examples drawings like these, especially if they are specific enough, convey an event in a way that written notes just couldn’t. They also set a tone of playfulness that complemented Gunner’s energetic facilitation style. But the greatest value of these conceptual snapshots may be that they gave event participants an opportunity to celebrate their work together. They gave a sense of reward, even joy, to the meeting as it progressed. If you are planning any future meetings, does this approach give you ideas about how to capture your own discussion sessions? Check out Graphic Recorders Indonesia’s blog post about the event. 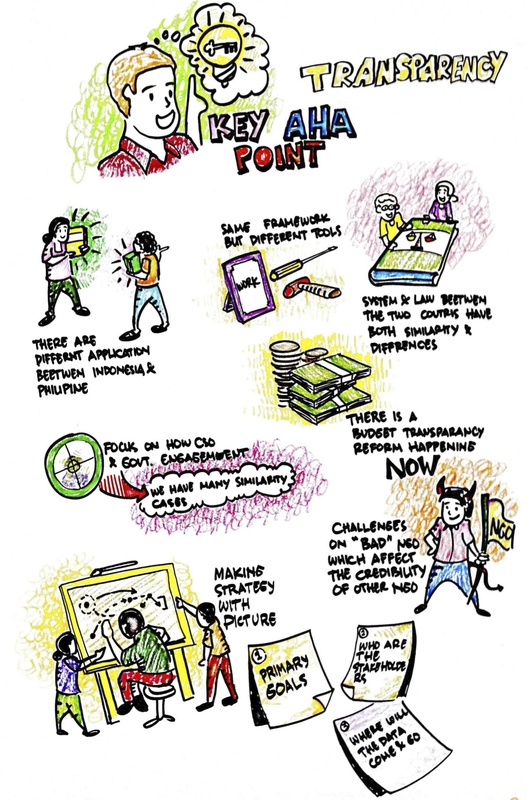 And for more on graphic recording, see this article from the World Cafe.